It’s that time of year again, have you planned your Christmas feast ideas? Hosting a memorable Christening feast is one of those joyous occasions in life that most families will experience only a few times. The success and sweet memories of your feast will depend on the creativity and imagination of the hosts and this includes your kitchen and what comes out of there. So with all the hard work that goes in planning a Christmas feast, remember to take a deep breath and really live in the moment! Similar to a wedding party, the sit down table option involves a table seating plan where your family or guests are served individually and usually a three course meal. You could consider making this a bit less formal by having more casual open seating with the main course being a self-service buffet (hot or cold). An informal catering option that’s not only perfect for small spaces, but caters easily to small children or standing guests (as well as your budget!). The types of food popular includes hot or cold bite-size hors d’oeuvres quiches, pies, pastries, cakes, fruit and sandwiches. An ideal and different option for eating with a limited seating option is food that can be easily eaten with a fork and without a knife! Foods like sandwiches, scones, cakes and pastries. Try adding a bit of fun and charm and include a lolly buffet where your guests can choose from a variety of novel lollies! Take the stress out of having it in your home and take it outdoor. A more relaxed, social and contemporary celebration becoming more and more common with younger couples who have barbeques, cold BBQ chickens or deli meats served with an array of salads and bread rolls. Great if the weather is a perfect 25 degrees! 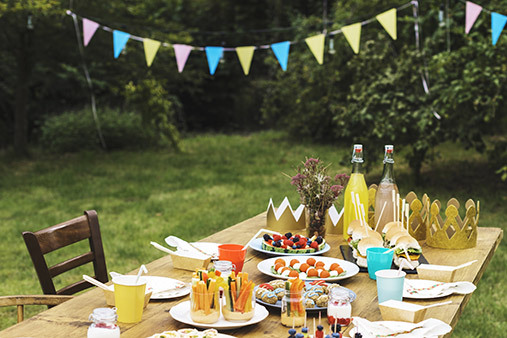 If your christening party will be at noon, a twist on the traditional b buffet lunch is hosting a breakfast brunch! Delicate quiches to be served cold and a praline French toast casserole along with garlic cheese grits, variety of muffins, hot buns with the baby’s initials baked in, lemon squares, coconut cookies or fruit and cream puddings, chocolate-dipped strawberries, and a delicate fruit salad can be a sure winner! We hope you find these ideas useful, and the team at Stir It Up Catering wish you a very Merry Christmas and Happy New Year!